Over the past four years, FreedomWorks has helped the conservative and libertarian movements grow and thrive. A million people marched on Capitol Hill in 2009. The GOP won a 60+ seat majority in the House in 2010. Freedomworks’ Super PAC raised over $15 million and spearheaded GOTV efforts in Senate races across the country planting yard signs by the truckload as far as the eye can see. Yet, conservatives lost many of the races we cared about most in 2012. While it has been argued that the top of our ticket did not inspire some, the fact remains that we did not get our voters to the polls in races we cared about most. If conservatives and libertarians are to achieve a Hostile Takeover of the GOP, we need to elect candidates whose loyalty to principle is greater than their loyalty to party. In order to do that, we need to move beyond being a political movement and become a political operation. There have been many recriminations over the past week as to the cause of the GOP electoral defeat. Some have suggested the GOP is the Leave it to Beaver party that has failed to keep up with ‘shifting demographics’. Others have pointed to the failure of Mitt Romney’s GOTV software known as Project ORCA. While Project ORCA was clearly a technological failure, the greater failure was that Mitt Romney’s GOTV effort was not localized. The same can be said of Mitt Romney’s voter integrity effort. As an election lawyer in Philadelphia, it does not surprise me that Mitt Romney did not receive a single vote in 59 Philadelphia voting divisions. From the moment poles opened until well into the afternoon, I observed long lines of voters snaking through polling locations in heavily Democrat neighborhoods of Philadelphia where every voter was handed a card instructing them how to vote. 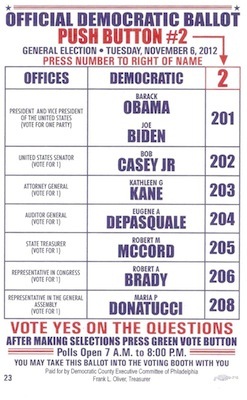 These are similar to the cards that were handed out in heavily Democrat neighborhoods in Bridgeport, CT in 2010. No such lines existed in Republican neighborhoods and similar cards were not handed out to voters asking them to vote for Republican or conservative candidates. From the time that poles opened until the moment they closed, there was a concerted effort by Philadelphia voting officials to weigh their thumbs on the scale of the election. Democrats fought efforts to seat Republican voting inspectors despite being presented with court orders to do so. In one instance, an election judge and the Democrat voting inspectors abandoned their polling location for the entire day, upset at being forced to work alongside Republican inspectors. I observed multiple instances of electioneering inside polling locations and had to return to the same polling locations on multiple occasions to chase electioneers away. I was even forced to instruct an election judge not to ‘pull the lever’ for a voter. When election judges were informed of electioneering inside their polling locations, they often pled ignorance or lack of responsibility notwithstanding instructions to the contrary from the Philadelphia District Attorney’s office. It is no longer sufficient for conservatives to drive the ideological agenda yet rely on party officials to drive GOTV and voter integrity efforts. Grassroots conservatives and independent groups must fund and organize these initiatives with the same level of urgency that liberal groups do. I observed two union painters asking for a receipt after they voted. When offered an ‘I voted’ sticker, they demurred insisting that the election judge provide them with a written receipt for having voted so their union boss could pay them for their time. Unions and liberal interest groups are reliable Democrat voters because they have significant economic interests at stake. Taxpayers, however, have just as much at stake as they are the ones footing the bills. Yet, taxpayers have not behaved with the same degree of urgency. In my experience, the Republican party has done a poor job organizing, planning and funding GOTV and election integrity efforts. It is time for grassroots conservatives and independent groups to step in if we are to save our country. Grassroots conservatives cannot merely register at True the Vote and watch polls in their own neighborhood. They must be vigilant in the prevention of fraud in neighborhoods where fraud traditionally occurs in states and elections where the stakes are highest. Grassroots conservatives must staff, fund, plan and organize these efforts with the same level of care and commitment that unions and liberal interest groups do. Barack Obama needed a 450,000 vote margin in Philadelphia to defeat Mitt Romney by 300,000 votes in Pennsylvania. Barack Obama needed a 240,000 vote margin in Cleveland to defeat Mitt Romney by 100,000 votes in Ohio. If conservatives do not want Cleveland and Philadelphia to continue to decide elections, let this serve as a wake-up call. Otherwise, America is destined to become a nation of Clevelands and Philadelphias. Getting candidates for conservatives to vote for is a lofty goal. There are immediate goals that should unite us, before we spend 100% of our time on candidates. Our military is about to be gutted. Benghazigate is being controlled by the left - when conservative American and our leaders should be on fire to prevent it. We will never win another election with the type of voter fraud that is easily done behind the scenes with the machines that have modems in them. In the blogs to the right of your article there is no reference to any of these important issues to Americans today . . . yesterday! This article is skewed. I live in Philadelphia, and there was both a Democrat and a Republican handing out cards at the doors of the polling place. There was a lawyer there to make sure that no election fraud took place. Everything seemed fine to me. Excellent! Many more people need to do this in more areas of the country! My sons (13 and 16) and I were part of a fairly large group of the Wake County Republicans in North Carolina who were poll greeters outside of the polling places handing out literature with lists of all the conservative candidates to those who would take them. Romney won North Carolina by about 100,000 votes. Wake County encompasses Raleigh. No, Juanita, the problem is not the election machines, it's the political machines. Democrats have one. Republicans don't. The Republican party is particularly ripe for takeover, but there are many Democrats who are quietly hostile to the Obama agenda. They are where Republicans were in 2004: unhappy with Bush's liberal junk, but not wanting to kneecap him when the liberals were screaming bloody murder over every imagined paper cut. So they play team ball. The long term need is to retake our institutions of education and media, but to win elections we need to take over the parties from within. The only way to do that is to vote in their primaries, attend their caucuses, and outnumber them at the local level. As precinct committeemen in the parties, we can do the kind of effective door-to-door GOTV work that needs to be done. Voter fraud exists, but it's not the cause of our troubles. In developing the Growth and Opportunity Project's Autopsy of the 2012 election (pdf), the Republican National Committee correctly identified the reason for the party's loss, but failed to recommend a coherent strategy to reverse it. President Obama won by defining his opponent in a negative way, and marrying modern technology with old-fashioned boots on the ground. Republicans can do those things even better than he did, but doing so will require radically reforming the party. I imagine I'm like many of my peers and despite November election results, I was hoping that the GOP might learn a lesson or two and adjust accordingly. I was skeptical, but hopeful nonetheless. Then the 100 page report happened and confirmed what I knew in my gut - the GOP hasn't learned one damn thing. And so, my list of grievances. Were I in D.C., I'd nail them to door of the GOP headquarters in the most theatrical way possible, but I digress.1. Why was Reince re-elected? Every year since college, my best friend Dan and I have submitted our best observations on a wide range of topics that reflect on the year that has just expired. We follow the well established template of The McLaughlin Group program. Here are my reflections on 2012. People are reading entirely too much into President Obama's re-election. He and Organizing for America, the Democratic Party, and allied groups simply beat Romney and the Republican National Committee, state parties, and aliied groups at getting out the vote.The reason Obama was able to do that is not because of policy or growing popular satisfaction with socialism. He convinced people that he was on their team, and they were on his. After that, nothing Romney said made a bit of difference.